The foundry operates two iron alloy batching plants. One plant is designed for the batching of the five iron alloys which are added during the primary casting in the rotary furnaces. The system records the data in a database together with the actual weights of the raw materials added to the casting. Each quantity batched is weighed using a four-loading cell system. The control system manages, in response to the weight figures taken instantaneously by the cells, the vibration frequencies of the extractors to guarantee maximum precision. 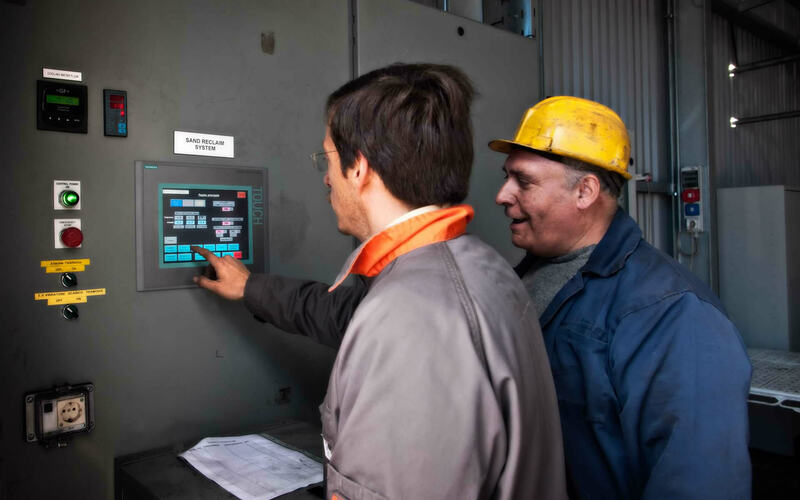 The plant is controlled by a PLC used by the operator responsible for loading the rotary furnaces and also by the general control panel situated in the metallurgic laboratory serving the heads of department.